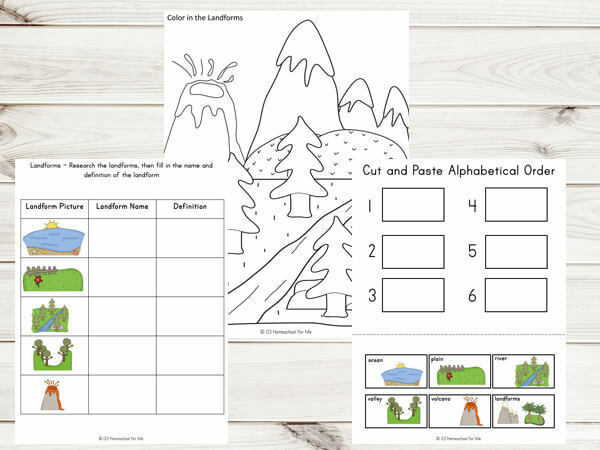 Learning about some of the different types of landforms is fun with this Landform Printable Pack. 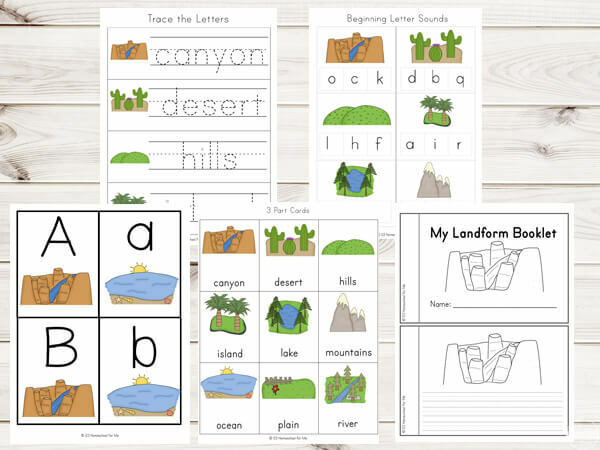 It focuses on eleven different landforms: canyon, desert, hills, island, lake, mountains, ocean, plain, river, valley and volcano. Don’t miss our other countries for kids resources! •Subtraction Cards – Cut out, laminate and use a peg or paperclip to clip or place a pompomor candy onto the correct answer. •Count and Clip Cards – Cut out, laminate and use a peg or paperclip to clip or place a pompomor candy onto the correct answer. •Addition Cards – Cut out, laminate and use a peg or paperclip to clip or place a pompomor candy onto the correct answer. •Odd One Out – Circle the object that is different. •What Comes Next? – Cut out and paste the answer in the correct spot. •Finish the Patterns – Cut out and paste the answer in the correct spot. •Coloring Activity – Color in the object using the color listed below. •Do-A-Dot Letter Activity – Using a dot marker or bingo marker, dot out all of the correct letters. •Dice / Graphing Activity – Cut out the dice and glue together. Roll the dice and graph each object the dice lands on. •Creative Writing Pages –Write a story about the picture. 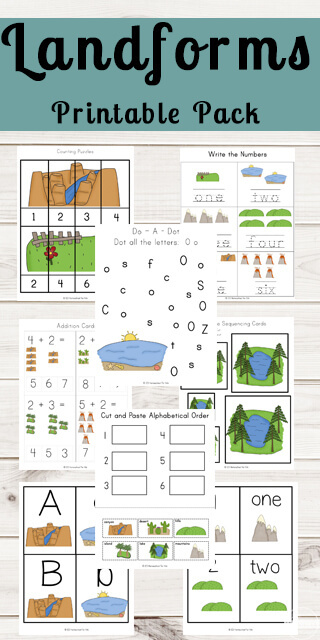 •Alphabet Cards – Cut out, laminate and use to match the lowercase and uppercase letters together. Can also be used to practice spelling beach-related words. 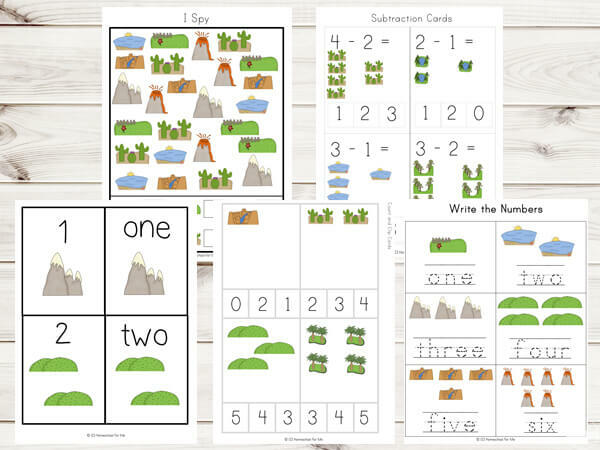 •Number Cards –Cut out and laminate and use to match the word to the number. •Trace the Letters – Improve handwriting skills while learning to spell. 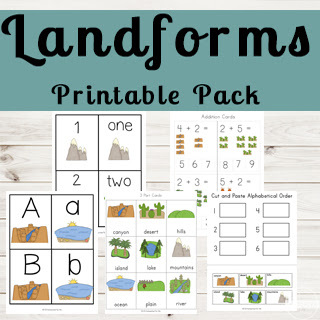 •My Landform Booklet – Write a sentence or two about each landform. •Landform Research – Research the landforms and write their definition in the box provided. •Beginning Letter Sounds – Cut out, laminate and use a peg or paperclip to clip or place a pompomor candy onto the correct answer. •Syllable Cards – Cut out, laminate and use a peg or paperclip to clip or place a pompomor candy onto the correct answer. For all the cards and puzzles activities, I prefer to print them out on white card stock and laminate them for durability and repetitive use. They can be kept together in zip lock bags or with binder rings. After they have been cut out, laminate and use a peg or paperclip to clip or place a pom pom or candy onto the correct answer.